Rosie wonders what the moon is made of. Cat thinks the moon is a saucer of fresh milk, Dog says it’s a pat of butter, and Butterfly believes the moon is made of sugar. But Gran knows best. Using milk, butter, sugar, and other ingredients, she bakes…the moon! what other things a child might think the moon was made of. There were so many possibilities, and a lot of the things I came up with were food. (Maybe I was hungry when I was thinking about it!) I wondered what would happen if several of these ingredients were combined to make something new. 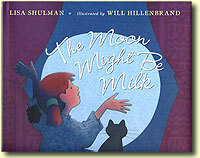 In The Moon Might Be Milk, Rosie asks different animals what the moon is made of. Each animal tells her something different, and at the end of the book we see that each answer is an important part of something bigger. Hopefully the story shows that sometimes there can be many answers to the same question, and that each answer can hold some truth.